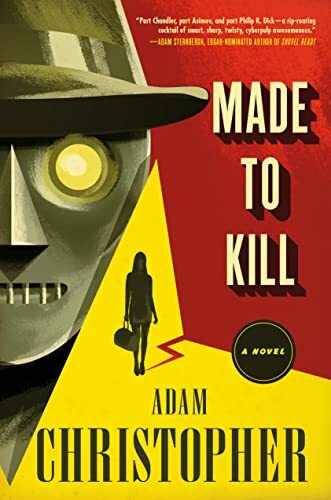 Today we’ve got an excerpt from Made to Kill by Adam Christopher (out today!) Enjoy! I woke up and stretched inside my mind—a tic from Thornton’s template, given I had nothing in particular to stretch— and looked around the computer room. Ada was all around me, her circuits clicking like a Cadillac cooling in an evening breeze. There was a newspaper sitting on the table in front of me. First edition, Wednesday, August 11. That was normal. What wasn’t normal was the fact that it was alone. Although I had no specific memory of it, I was sure my hat usually kept it company. And what in turn kept my hat company was my jacket, which should have been on the back of the chair. Something wasn’t right, although I had no empirical data to go on. It was just a hunch. A feeling somewhere in the diodes down my left side. I glanced down. My chest door was open and the cables were plugged in. Th en I saw that my jacket and hat weren’t the only items of clothing missing. Gone too were my shirt and tie, pants, underwear, shoes, socks, the lot. I was as naked as the day I was built, six feet ten of bronzed steel and nothing else. That wasn’t necessarily a problem. I was a machine, after all. The clothes were an afterthought but I liked suits and hats and shoes (especially shoes) and I wore them because it made me feel more normal. I looked up and into the winking and blinking lights of the console on my right. Ada hadn’t said anything yet, but before she spoke there was a pause like she was dragging on her fifth cigarette of the morning. I unplugged and stepped out of the alcove and moved to the table and looked at the paper. I wondered who delivered it. Maybe it wasn’t delivered. I supposed the first edition was probably on sale before midnight and I supposed there was a newspaper box on the corner outside the office. The person who delivered the paper to the table in the computer room was probably me, making sure I had a chance to catch up on the world around me as soon as I got out of bed. A small but vital effort in compensating for the fact that I couldn’t remember yesterday at all. “Oh?” I paused and started an internal diagnostic. The universe had been created four minutes ago and everything felt real swell, but I didn’t like Ada’s tone. “Oh.” I liked that hat. So I said thanks and went over to it. It looked like a tall white cabinet like the other tall white cabinets in the room, and when I opened it I found it had a dozen suits in brown and yellow pinstripe and three long trench coats in tan and two hats and a bunch of folded shirts and rolled ties. I had no idea I kept such a gentleman’s wardrobe. There was a drawer at the bottom that had five pairs of black shoes lined up in a neat row. “Oh,” I said again, and Ada laughed while I got dressed, but at least when I was dressed I felt myself again so I turned back around and watched the tapes spin and the lights flash and I asked the obvious question. I gave my diagnostic subroutine the hurry up. Maybe Ada sensed something because she laughed again. Coming from her I took that as a compliment. But it was a relief, anyway. I put the diagnostics on the back burner and stood there in the computer room like a statue for a while. Ada didn’t speak. The clock above the door that led to the outer office ticked away toward oblivion. Outside the window the sun was casting long shadows on the rough brick of the building opposite. I glanced at the paper and thought about picking it up to read and then I thought twice. “I was just thinking,” I said. I thought about the color magenta. I thought about the color gold. I thought about Egyptian princesses. I don’t know why I thought about these things, but I did. They were fragments. Abstract ideas floating around in my circuits. Something from yesterday, probably. The more I thought about these things the more they faded away. After a few minutes of chasing echoes around my circuits I cleared my throat, or I pretended to. It sounded like the clutch in my Buick slipping and this got Ada’s attention. “Don’t worry about it, Chief,” she said. I glanced down at the newspaper. Kennedy was in Cuba and there was a special film premiere on Friday. Special enough to be front- page news, with a photo of a guy in dark glasses and a carved block of wood on his head that I took to be his hair and very poor taste in clothes. His picture was bigger than the president’s. “Anything I should know about yesterday?” I asked, my eyes back on the spinning tapes and flashing lights. Some of the tapes stopped spinning and reversed at top speed. I didn’t like it when that happened. Ada wasn’t telling me something. I shrugged, on the inside anyway. This was how it worked. Ada ran the show and I did the heavy lifting. She could remember yesterday and I couldn’t. So all I could do was trust her and do what she said. Today was a new day and there was a new job. There was a printer to my right, underneath one of the consoles. It began spitting out a continuous sheet of perforated paper. It sounded like a sewing machine on overdrive. I walked over and picked up the edge of the paper and slid it through my fingers as I read the information coming out of the wall. The letters were big and black, all capitals. A name. An address. A number. The address was the Ritz-Beverly Hotel. It was on Sunset Boulevard. That didn’t bother me. It wasn’t far to go. The number I took to be a room somewhere in the hotel. So far, so good. The name I didn’t recognize and there was the rub. I thought I should. I tried again but came back with a handful of nothing. If I had known it, I didn’t now. Maybe I never had. Maybe it was just an echo of Thornton’s template stuck between a solenoid and a silicon chip. Because with his personality and mannerisms came his memories. Not all of them and not memories exactly. But impressions, ideas, notions that were vague and smoky. Maybe Thornton had known a person called Eva McLuckie. I looked up and picked a point where the wall met the ceiling. There were no electronic eyes in the computer room but I knew Ada could see me. I looked down at the paper in my hand. My eyes were drawn back to the name, no matter where else I pointed them. While I fought with my optics another printer began churning. There was a long slot in the computer bank above the ticker-tape machine. Photographic printer. We didn’t always get pictures, but they were useful when we did. I didn’t know how Ada got our clients. Contacts made while we were a detective agency, probably. You meet all kinds in that line of work. But that wasn’t my department. My department was walking out the door and doing the job. Today, seemed like I had a little help. The chundering stopped and a photograph flopped out of the printer and into the catch tray like a disappointed man falling into an empty bed. The picture was facedown. I reached for it. “I don’t like this,” said Ada when my hand was halfway home. Ada was silent. Maybe she was thinking things over. I read the info sheet again. Then I looked up. Then I thought again about the color magenta, and when I thought about gold this time it wasn’t the color but the metal. It was something from yesterday. Ada seemed to sigh, or maybe I just thought she did. Somewhere in the afterimage of a memory an older woman pulled her legs up off the desk in the front office and tucked her skirt down a little as she turned to look out the big window as stormy weather approached. I didn’t like that imagery much so I forgot about it and reached for the photo and picked it up and turned it over and held it up so I could get a good look. I looked at the photograph and I had a sinking feeling somewhere between my voltage converter and neutron flow reversal coil. “You too, Chief,” she said. “Okay,” I said. I curled the photo and slipped it into my jacket. Then I grabbed one of the new hats from the closet. I was ready to roll. All I needed was the word from Ada. I stood there with my hat in my hand for quite a while. To make a change I put the hat on and stood there some more. I looked around the room for nothing in particular. My hat suddenly felt like it didn’t fit so I took it off and checked the label inside. I assumed this number was the same size as the old one so I put it back on. It didn’t feel any better. Ada’s tapes chattered and lights flashed. She wasn’t talking. I didn’t like it. I stood there a while longer and then when I was done standing I reached into my pocket and took out the photograph of the target. She was a girl. Young, maybe twenty, maybe not quite. She had black hair cut in a bob that was big at the back and small at the front and her bangs were so straight you could use them to survey a building. She had a small face made smaller by the thick, dark rings of eyeliner. She looked like an Egyptian princess. This was Eva McLuckie. I wondered who she was. I wondered what she had done to get herself on someone’s hit list. As I stood on the spot I had a feeling I had known the answers to both of those questions yesterday. I had just forgotten what those answers were. adam christopher, excerpt, Made to Kill.